As much as I do like scandinavian hc/punk, there's no way I'll ever start collecting originals from there. Australian, japanese and colombian records have already proved to be a money pit that my wallet can barely affort. So I'm glad that some years ago someone decided to boot the legendary one and only sweden's Absurd "s/t" 7" from 1982. Also known as "Blodig Stad", this is one of those swedish records that goes for buckets of money. I guess this and of course the fact that they sing is swedish is the only common point with bands like Skitlickers or Anti Cimex. 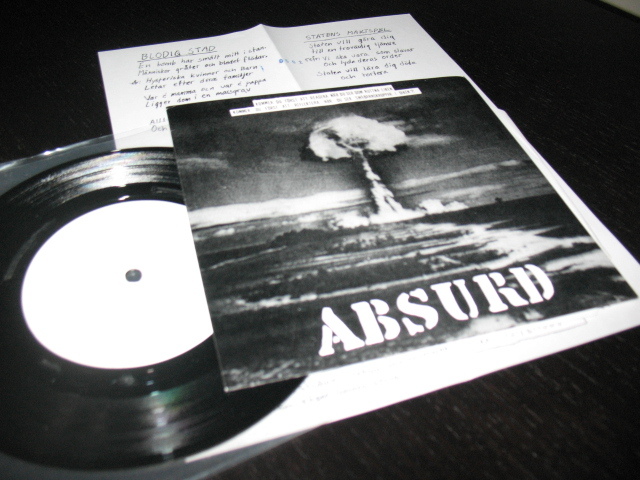 If swedish trademark is the brutal and heavy sound, Absurd went in the opposite way. They indeed sound more like a way sloppier euro version of Minor Threat, expecially for the guitar sound. The singer left punk to become a bloody priest. Legend tells they did a reunion in early 90s' and he went on stage wearing his old spyked jacket over his priest suit, ahahah!! Anyhow, essential record! Matrix have been stratched so brutally that it looks like they did it with a pneumatic drill! !